Gum recession is one of the most common signs that you may be suffering from periodontal disease. If you notice teeth appearing longer in length, followed by dental sensitivity to hot and cold foods, you may be experiencing gum recession and tooth root exposure. For moderate to severe cases, Dr. Navid Baradarian can perform a traditional gum grafting procedure at our New York, NY, dental practice to prevent further recession and bone loss. This procedure can also reduce the exposure of tooth roots. Gum grafting is an effective gum disease treatment designed to prevent further damage from occurring and can be effective if more conservative treatments have failed. Dr. Baradarian uses advanced techniques to minimize your discomfort during the procedure, but we can provide sedation options if necessary. Simply following a good dental hygiene regimen and visiting the dentist for biannual examinations and cleanings can help prevent gum recession. Professional cleanings can help catch early signs of periodontal disease, remove hard-to-reach plaque, and correct improper brushing techniques. During your cleaning, the dentist will also conduct a thorough evaluation of your teeth, gums, and jawbone with x-ray technology to detect the earliest signs of gum disease undetectable to the untrained eye. Scaling and root planing, also known as a deep cleaning, may be recommended if a regular hygienic cleaning is insufficient to restore your gum health. During your consultation, the dentist may also recommend restorative and cosmetic dental treatments, such as fitting you with a mouth guard to wear at night to prevent teeth grinding. While minor gum recession can occasionally be treated with nonsurgical periodontal therapy or less invasive surgical treatments such as Chao Pinhole surgery, Dr. Baradarian will recommend gum grafting surgery if your condition is more severe. This procedure not only repairs the infected area but prevents further damage from occurring. "Gum grafting is an effective gum disease treatment designed to prevent further damage from occurring and can be effective if more conservative treatments have failed." Before beginning the procedure, Dr. Baradarian will administer local anesthesia to numb the gums and surrounding tissue while also providing optimal comfort. He can then make an incision in the roof of your mouth to remove a sliver of tissue and apply it over the thinning gums. Once exposed tooth roots are covered, he will stitch the tissue in place. The overall procedure takes approximately one to two hours and you can generally resume regular activity within 24 hours. 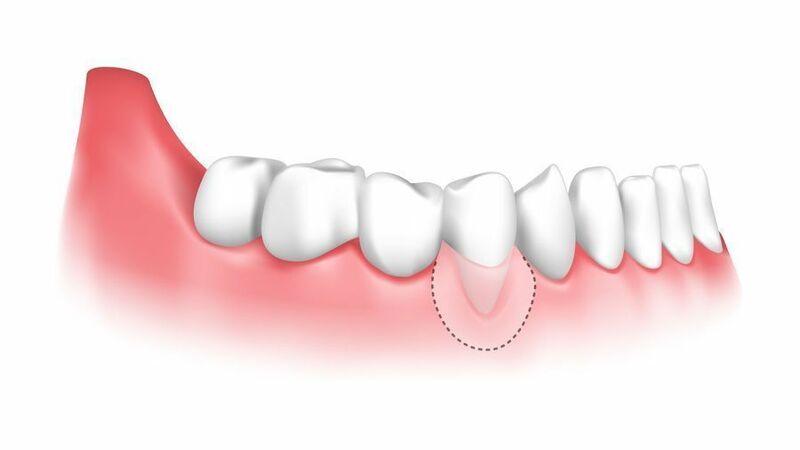 Over time, the graft will integrate with your existing gums to promote healthy tissue regrowth. Dr. Baradarian will monitor your recovery through a series of follow-up visits to ensure the graft is successfully integrating. Depending on the extent of treatment you received, you could require up to six follow-up visits. You must attend these follow-up appointments to ensure that you are healing properly and that there are no developing complications. Most patients can achieve a full recovery in two weeks.